Hc Verma i Solutions for Class 11 Science Physics Chapter 9 Centre Of Mass, Linear Momentum, Collision are provided here with simple step-by-step explanations. These solutions for Centre Of Mass, Linear Momentum, Collision are extremely popular among class 11 Science students for Physics Centre Of Mass, Linear Momentum, Collision Solutions come handy for quickly completing your homework and preparing for exams. All questions and answers from the Hc Verma i Book of class 11 Science Physics Chapter 9 are provided here for you for free. You will also love the ad-free experience on Meritnation’s Hc Verma i Solutions. All Hc Verma i Solutions for class 11 Science Physics are prepared by experts and are 100% accurate. Yes, if all the particles of a system lie in the X–Y plane, then it's necessary that its centre of mass lies in the X–Y plane. As all the particles lie in the X–Y plane, their z-coordinates are zero. Let the ith element of mass ∆mi is located at the point (xi,yi,zi). X, Y and Z lie inside the cube because it is a weighted mean. The centre of mass is defined as R→=1M∑imiri→. Suppose we define "centre of charge" as R→c=1Q∑iqiri→ where qi represents the ith charge placed at r→i and Q is the total charge of the system. (b) Yes. Because the z-coordinates of all the charges are zero, the centre of charge lies in X-Y plane. There is no violation of conservation of momentum because in the earth's frame the component of tension is acting in the horizontal direction. Two bodies make an elastic head-on collision on a smooth horizontal table kept in a car. Do you expect a change in the result if the car is accelerated in a horizontal road because of the non inertial character of the frame? Does the equation "Velocity of separation = Velocity of approach" remain valid in an accelerating car? Does the equation "final momentum = initial momentum" remain valid in the accelerating car? If the gravitational potential energy of the system is −48 J, the total energy of the system will be zero. However, the linear momentum will be non-zero. K.E=12mv2=p22mwhere, p is the linear momemtum having value mv. But linear momentum cannot be determined even if the kinetic energy is known because linear momentum is a vector quantity, whereas kinetic energy is a scalar quantity. Thus, the direction of the linear momentum remains unknown, however its magnitude can be calculated. Suppose we define a quantity 'Linear momentum' as linear momentum = mass × speed. The linear momentum of a system of particles is the sum of linear momenta of the individual particles. Can we state principle of conservation of linear momentum as "linear momentum of a system remains constant if no external force acts on it"? To accelerate a car we ignite petrol in the engine of the car. Since only an external force can accelerate the centre of mass, is it proper to say that "the force generated by the engine accelerates the car"? Yes, it's proper to say that the force generated by the engine accelerates the car. When petrol burns inside the engine, the piston moves, which in turn rotates the wheel. As the wheel rotates, the frictional forces from the road moves the car. Consider the situation of the previous problem. Take "the table plus the ball" as the system. friction between the table and the ball is then an internal force. As the ball slows down, the momentum of the system decreases. Which external force is responsible for this change in the momentum? This implies that the linear momentum of the system remains constant. i.e. A does not imply B. Hence, we can say, B implies A but A does not imply B. Let half of the particles lie on +Y-axis and the rest of the particles lie on +X-axis. Therefore, the coordinates of centre of mass are R2,R2. For the given situation, R'<R. In general, R' ≤ R.
Centre of mass of the circular plate lies at its centre. Centre of mass of the square plate lies at its centre. ∴ Centre of mass of the system lies in the square plate. Applied force Mass of the sphere ,which is independent of height h.
where M is the initial mass of the body, at rest. The final mass of the two pieces moving with equal speeds in opposite direction is equal to M2. (d) 2mv2r must be acting on the ring. To move the centre of the system in a circle of radius r with a uniform speed v, the external force required is 2mv2R. A nucleus moving with a velocity v→ emits an α-particle. Let the velocities of the α-particle and the remaining nucleus be v1 and v2 and their masses be m1 and m2. (a) v→,v→1 and v→2 must be parallel to each other. (b) None of the two of v→,v→1 and v→2 should be parallel to each other. 0,0, 1,0 and 12,32 respectively. From the above equation, it can be concluded that all the x-coordinates may be non-negative. then, acceleration of centre of mass=F→netM=0. Hence, the centre of mass of the system lies at distance R3 from the centre of bigger disc, away from centre of the hole. Let the centre of the circular disc be the origin of the system. Hence, the new centre of mass of the system (circular disc plus square plate) lies at distance 4d(π+4) from the centre of circular disc, towards right. Therefore, to keep the position of centre of mass unchanged, the block of mass 20 kg should be moved by a distance of 1 cm, towards left. 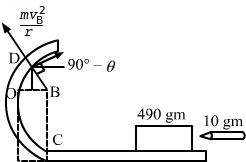 Therefore, the 30 kg block (m2) should be moved by 1 cm downwards in order to raise the centre of mass by 1 cm. Consider a gravity-free hall in which a tray of mass M, carrying a cubical block of ice of mass m and edge L, is at rest in the middle. If the ice melts, by what distance does the centre of mass of "the tray plus the ice" system descend? As no external force is experienced in longitudinal direction, the centre of mass would not shift. Therefore, the cart moves a distance of mLM+m towards right. Therefore, the balloon descends through a distance mLM + m.
Therefore, the ratio of linear momenta is 1:2. Here, m1 and v1 are the mass and velocity of the alpha-particle repectively, and m2 is the mass of the residual nucleus. Therefore, the speed of the residual nucleus is 2.4×105 m/s. Here, m1 and v1 are the mass and velocity of the man respectively, and m2 and v2 are the mass and velocity of the Earth respectively. Hence, the earth recoils with a speed of 1.5 × 10−23 m/s. During this time, the man covers a horizontal distance x and lands in the water. Thus, the minimum horizontal velocity imparted to the bag, such that the man lands in the water is Mmx2gH-H-h.
Let the bag lands at a distance x' towards left from actual line of fall. Therefore, the bag will land at a distance Mmx. i.e. There is no change in magnitude of the momentum of the ball. Light in certain cases may be considered as a stream of particles called photons. Each photon has a linear momentum h/λ where h is the Planck's constant and λ is the wavelength of the light. A beam of light of wavelength λ is incident on a plane mirror at an angle of incidence θ. Calculate the change in the linear momentum of a photon as the beam is reflected by the mirror. If the centre of mass is at rest, the third part having equal mass as that of the other two masses will move in the opposite direction (i.e. 135° w.r.t. +x-axis) at the same velocity of 102 m/s.. According to the question, the spaceship is removed from all other material objects and kept totally isolated from the surroundings. Thus, the mass loss by astronauts couldn't slip away from the spaceship. Therefore, the total mass of the spaceship remains unchanged and so does its velocity. The speed of ball after the collision is v2. Let the man of mass m approaches towards the engine with a velocity v' w.r.t the engine. ∴ The velocity of man w.r.t earth is v' − v, towards right. When the man on the right jumps, his velocity w.r.t. the car is u. Therefore, the speed of the bigger block when the smaller block reaches point A of the surface ismvm+M. Hence, the velocity of second ball is 2.5 m/s, opposite to the direction of motion of the first ball. Find the speed of the second particle as a function of time during the collision. Let v' be the speed of the second particle, during collision. The speed of the second particle during collision can be written as a function of time and is given by the expression, u2-m1m2t∆t(v1-u1). m' is the fractional mass of the ball that sticks with the bullet. Therefore, the velocity of the bullet after the collision is mv-(M-m')v1m+m' . Hence, the coefficient of restitution is found to be 12. Let the final velocities of the blocks be v1 and v2 respectively. Let v1 and v2 be the final velocities of the first and second block respectively. For maximum value of u, denominator should be minimum in the above equation. For minimum value of u, denominator should have maximum value. Two friends A and B (each weighing 40 kg) are sitting on a frictionless platform some distance d apart. A rolls a ball of mass 4 kg on the platform towards B which B catches. Then B rolls the ball towards A and A catches it. The ball keeps on moving back and forth between A and B. The ball has a fixed speed of 5 m/s on the platform. (a) Find the speed of A after he catches the ball for the first time. (c) Find the speeds of A and B after the all has made 5 round trips and is held by A. (d) How many times can A roll the ball? (e) Where is the centre of mass of the system "A + B + ball" at the end of the nth trip? The velocity of A will be 5011 m/s and the velocity of B will be 5 m/s. (d) As after 6 round trips, the velocity of A becomes 6011 i.e. > 5 m/s, it cannot catch the ball. Thus, A can only roll the ball six times. Let the coefficient of restitution be e.
Hence, the coefficient of restitution is 32. After the collision, it's velocity decreases continuously. At an instant the whole system (Block A + the compound spring + Block B) moves together with a common velocity V (say). Let the ball strikes the inclined plane at origin with velocity v0=2gh. where t is time of motion of the ball in air, as the ball moves from origin to point P.
The ball makes an angle β with the horizontal, after the collision. After the collision, let the velocity of the particle and the block be V.
Let the spring be stretched through an extra deflection of δ. The bullet strikes the pendulum with a velocity of 280 m/s. Let the velocity of the block be v'. Hence, the speed of the bullet as it emerges out from the block is 250 m/s. (b) Let the maximum elongation in spring be x. As the net external force on the system is zero, the centre of mass does not shift. Let the acceleration of mass m2 be a2. Due to the force F2, the mass m1 experiences a pseudo force​. Similarly, mass m2 experiences a pseudo force due to force F1. Let m1 be displaced by a distance x1 and m2 be displaced by a distance ​x2. Consider a gravity-free hall in which an experimenter of mass 50 kg is resting on a 5 kg pillow, 8 ft above the floor of the hall. He pushes the pillow down so that it starts falling at a speed of 8 ft/s. The pillow makes a perfectly elastic collision with the floor, rebounds and reaches the experimenter's head. Find the time elapsed in the process. Let the velocity of man be V→m. As no external force acts on the system, the acceleration of centre of mass is zero and the velocity of centre of mass remains constant. Let the block B just manages to reach the man's head. As the collision is elastic, K.E. and momentum are conserved. Block a should be started with a minimum velocity of 2.5gh to get the sleeping man awakened. Let the velocity of m be v; and the velocity of 2m be v'. Let the velocities of m and 2m after the collision be v1 and v2 respectively. (b) Let the heights reached by balls 2m and m be h1 and h respectively. As h2 is more than 2l, the velocity at the highest point will not be zero. Let us consider a small element of chain at a distance x from the floor having length 'dx'. According to the given condition, the element comes to rest. Thus, the total force exerted is given by. The two blocks move together, sticking to each other. As the collision is perfectly elastic, linear momentum is conserved. Let the 2 kg block covers a distance of S1. 12×2×(0)2 + 12×2×(0.2)2 = -2×0.2×10×S1⇒ S1 = 1 cm. Let the 4 kg block covers a distance of S2. Let the time taken by the block m to reach the bottom end be t.
Figure shows a small body of mass m placed over a larger mass M whose surface is horizontal near the smaller mass and gradually curves to become vertical. The smaller mass is pushed on the longer one at a speed v andvm=u=a2t=mg sin α cos αM+m 2ha sin α=2m2g2h sin2α co2α(M+m)2 a sin α1/2 the system is left to itself. Assume that all the surface are frictionless. (a) Find the speed of the larger block when the smaller block is sliding on the vertical part. (b) Find the speed of the smaller mass when it breaks off the larger mass at height h. (c) Find the maximum height (from the ground) that the smaller mass ascends. (d) Show that the smaller mass will again land on the bigger one. Find the distance traversed by the bigger block during the time when the smaller block was in its flight under gravity. (b) When the smaller block breaks off, let its resultant velocity be v2. (d) Because the smaller mass also has a horizontal component of velocity V1 at the time it breaks off from M (that has a velocity v1), the block m will again land on the block M.
A small block of superdense material has a mass of 3 × 1024kg. It is situated at a height h (much smaller than the earth's radius) from where it falls on the earth's surface. Find its speed when its height from the earth's surface has reduce to to h/2. The mass of the earth is 6 × 1024kg. Here, the collision occurs due to the component v cosα.